This note demonstrates that using SYMMIC for thermal analysis is just about as fast as using a spreadsheet, so you won't be wasting time setting up finite element problems. Obviously, SYMMIC lets you know about temperature problems with a design a lot faster than building devices and taking measurements, but you might be surprised to learn that expensive measurement systems don't get close to measuring the peak temperatures reported by SYMMIC. SYMMIC outperforms competing thermal simulators, giving you the fastest turnaround in the industry. Is your current thermal analysis ignoring critical details due to erroneous assumptions? This application note shows how a thin epi-layer can have a big effect on peak junction temperatures. Are you considering all the potential places where your design might see a cooling benefit? SYMMIC can tell you how a passivation layer might improve thermal performance, which is something no spreadsheet analysis can do. 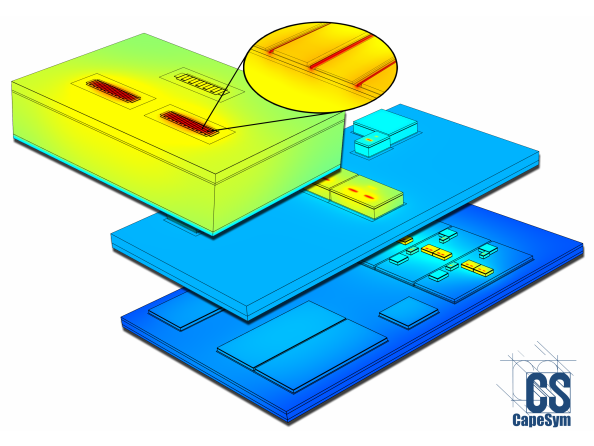 Closed-loop electro-thermal analysis uncovers temperature effects on the operating characteristics of a MMIC design. Use SYMMIC to explore the effect of solder bump locations on thermal performance. A detailed summary of worked examples available on the website.